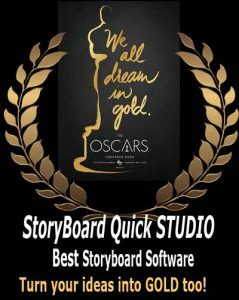 We sometimes are asked about the difference between our popular storyboarding software, StoryBoard Quick, and our premiere previz program, StoryBoard Artist. There are quite a few differences—as you can see here—but one of the biggest additions is the Timeline, which allows for sound tracks and animatics. The flexibility of the Timeline is perfect for those who need to communicate a precise vision for their pre-production. Each Frame’s duration can be individually set by just dragging the frame on the Timeline, and transitions can be set between each storyboard for added presentation effects. Set these storyboards alongside sound tracks and music, and you’re one step closer to finishing your film or music video project! Adding tracks of sound is as easy and drag-and-drop, and they can be rearranged and trimmed within the Timeline, then exported along with your Frames! StoryBoard Artist allows you to export in a variety of formats, and one of the most popular is the animatic: a video of your storyboards that shows the timing of your shots with accompanying sound in a format that anyone can view—you can even post it on your website! For a comparison of the features of StoryBoard Quick and StoryBoard Artist, click here!